We’d love your help. Let us know what’s wrong with this preview of Dead Jed 3 by Scott Craven. With seventh grade behind him, Jed jumps at the opportunity to spend the summer in Mexico with his dad. But there's just one catch: Luke and Tread get to tag along. In Mexico, fitting inmight be easier than Jed imagined, with Holidays such as Dia de los Muertos (Day of the Dead). Here, a rising 8th grade zombie boy and his zombie dog won't draw that much attention. But then With seventh grade behind him, Jed jumps at the opportunity to spend the summer in Mexico with his dad. But there's just one catch: Luke and Tread get to tag along. ​In Mexico, fitting in​might be easier than Jed imagined, ​with Holidays such as Dia de los Muertos (Day of the Dead)​.​ Here, a ​rising 8th grade zombie ​boy ​and his zombie dog ​won't draw that much attention. Their antics manage to ​capture the attention of a doctor​ who​se knowledge of the undead ​caus​es Jed to question his very existence. ​Is this the answer Jed's been hoping for since his parents sat him down for the "you're a zombie" talk? Jed may have finally found a way to be normal, but at what cost? To ask other readers questions about Dead Jed 3, please sign up. Afte This is a series that is very close to my heart. Craven's laugh-out-loud humor feels like home, my heartstrings playing songs of middle school guffaws and witty punch lines. But it's not just the humor that kept me reading; it was the main character. Jed is truly genuine and good-hearted, the kind of kid you hope your kids make friends with, and I couldn't help but feel sympathy for his plight in life. It isn't easy being the odd-zombie-out. But that's where this book gets super interesting. I've been a writer most of my life, with my earliest verifiable work coming in third grade when I established a link between the Pilgrims and the invention of Thanksgiving (since repudiated). The Dead Jed trilogy is my first trilogy, and first three books I've ever written. I started one back on college at Cal Poly, San Luis Obispo, and quit after the first page (I used an electric typewriter back I've been a writer most of my life, with my earliest verifiable work coming in third grade when I established a link between the Pilgrims and the invention of Thanksgiving (since repudiated). The Dead Jed trilogy is my first trilogy, and first three books I've ever written. I started one back on college at Cal Poly, San Luis Obispo, and quit after the first page (I used an electric typewriter back then, cutting-edge tech). I have no idea what it was about, but I am sure it was like every other story I wrote in which I tried to mimic Stephen King. I've been a journalist for 35 years, the last 30 with The (now departed) Phoenix Gazette and The Arizona Republic. I love telling stories, whether they are mine or those of others. 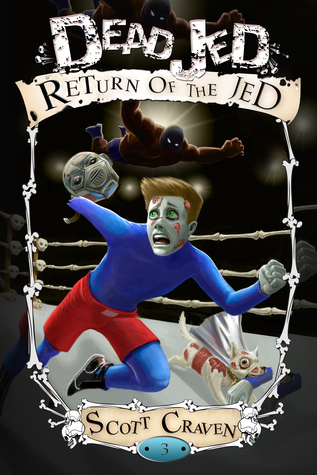 Dead Jed has its roots in my own horror that was seventh grade. I just wanted to fit in, but at 4 feet, 6 inches tall, all I fit into were lockers and trash bins. I eventually reached average height and was able to turn those misadventures into a book starring a zombie who, yes, just wants to fit in. Only Jed's story is way funnier than mine, and he gets even. I never did.